Instead of celebrating Mardi Gras in a skimpy costume to the beat of steel drums in Trinidad, I’m stuck in freezing cold New York stuffing two gigantic suitcases, preparing to take off for Finland. On days like this when food is just an afterthought, I often stop by the wonderful Japanese-Korean convenience store in my neighborhood, m2m, to pick up a tray of sushi and a few contrasting kimchi. (Boringly enough, I always choose the standard-issue white radish pickled in hot red pepper sauce, although they also carry a dozen more exotic varieties, such as lotus root, squid, or dried shrimp). Best of all, the store is cheap, cheap, cheap, at least by Manhattan standards. I’ve never really noticed before that they have a tiny fresh produce section tucked away in the dark back corner. Among the vegetables, I was drawn to the alluringly thick fresh jumbo udon noodles, essentially soups in a box. (See this site for more udon ideas – Engrish alert! If you are stuck with the more common instant ramen, check out this quirky Seattle-based website.) Because of the bone-chilling breeze blowing down the river, a bowl of hearty soup sounded a lot more appealing than cold pieces of nigiri and maki. At home, I quickly boiled some water and, in futile efforts to get rid off stuff that will spoil while I’m gone, threw in some mushrooms and vegetables from the fridge. Normally I’m not a huge fan of the MSG-laden flavor sachets that come with many instant noodles, but the one accompanying the jumbo noodles tasted just fine. Best of all, I was slurping piping hot soup within ten minutes of arriving home. Add the noodles to the boiling water, boil for 2 min. 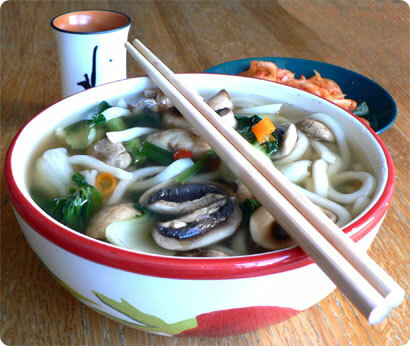 Slice the mushrooms, chillies, spring onion and gently pull apart the bok choy. 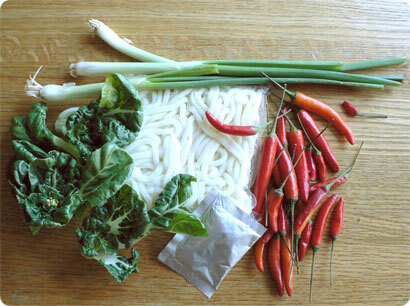 Add the contents of the flavor sachet and all fresh ingredients to the soup, boil for 2 minutes, and serve. I accompanied the soup with white radish kimchi and warm sake, and had hot steamed Chinese custard buns for dessert. Yum! But yeah, I rather have ramen and udon fast food places anytime .. yummers. I think Asians have some kind of obsession on extremely slippery foods. The more slippery noodles the better. I love those soups. The kinds of filled with different ingredients and not like the bare broth they sometimes serve in asian restaurants in Finland.